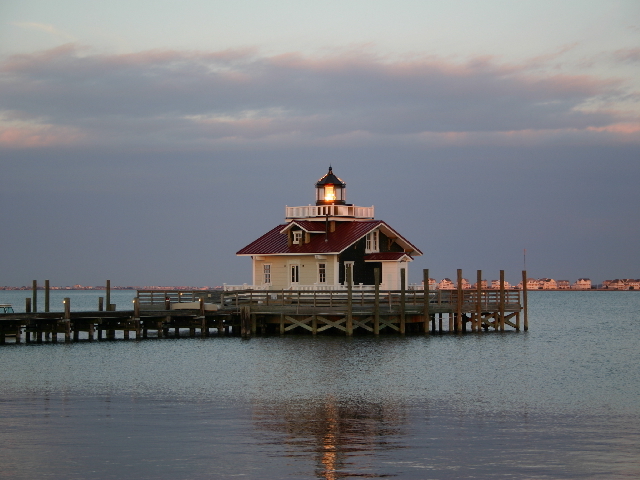 To visit the Roanoke Marshes Lighthouse Replica, take Hwy. 64 to the town of Manteo. Turn right on Agona Street. When Agona Street becomes Fernando Street, continue going straight and the lighthouse will be located at the end of the pier at the small waterfront park on the right side of the street. This is a close up of the lantern room and gallery. Front view of the lighthouse from the pier. As part of a continuing effort to make the sounds of North Carolina easier and safer for mariners to navigate, the Roanoke Marshes Lighthouse was built to mark the narrow channel that connects the Pamlico & Croatan Sounds. The construction of the lighthouse was completed and it was put into service in 1831. It wasn’t long until the existence of the lighthouse was threatened though. A local property owner claimed that the government built the lighthouse on private property without having the permission to build there. A lawsuit was later filed and the government decided to discontinue the use of the lighthouse in 1839.
screw-pile style lighthouse stood atop seven metal screw-piles that were literally screwed into the muddy bottom of the sound. The lighthouse was fitted with a fourth-order Fresnel lens and produced a fixed white light that could be seen up to eleven miles. After a few years passed, it was realized that the water in which the lighthouse stood was getting deeper. Originally constructed in four feet of water, the water level rose to a depth of thirteen feet, causing the lighthouse to flood. The rise in water also resulted in worm damage to the structure. Authorities determined that another lighthouse was needed. In 1876, crews went to work constructing the new lighthouse. A year later, in 1877, construction was completed at new location approximately one hundred yards from the previous lighthouse. The square screw-pile lighthouse was also fitted with a fourth-order Fresnel lens and shown a fixed red light. Throughout its years of service, the light station underwent several renovations. During these renovations, the nighttime characteristic and the day-mark of the station changed in an attempt to more effectively mark the channel. The lighthouse was in service until 1955, when it was decommissioned. 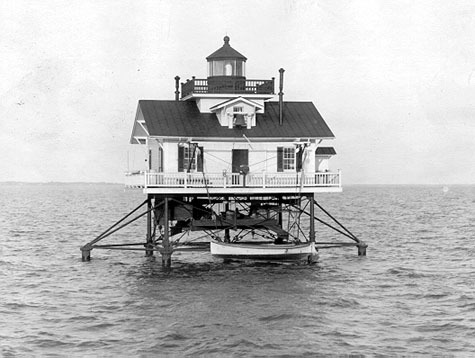 Mr. Wiggins, who planned to move the structure to private property, purchased the lighthouse. The lighthouse was cut from its pilings and placed on a barge. But before it could be moved, the lighthouse fell into the sound where it remains today. The town of Manteo has taken on the task of reconstructing an exact replica of the 1877 lighthouse. The lighthouse is in the final stages of construction. The lighthouse will not be used as an aid to navigation, but a fourth-order lens has been loaned to the North Carolina Maritime Museum and has been installed into the replica's lantern room. The replica was officially dedicated and opened to the public on September 25, 2004. The fourth-order Fresnel lens has been installed in the tower. These original photos of the third Roanoke Marshes Lighthouses were submitted by Melody Leckie from the archives of the Outer Banks Conservationist, Inc. In the original 1877 lighthouse, there were several rooms on the main floor. These rooms were not constructed in the replica. At the time of this photo, the lens was not installed in the tower, nor was it known whether or not a lens could be found for the replica. The setting sun reflecting off the lantern room glass is responsible for this light show. This 3D poster inside the replica gives important dates of the light's history. This is the view from the lantern room looking back toward Manteo.